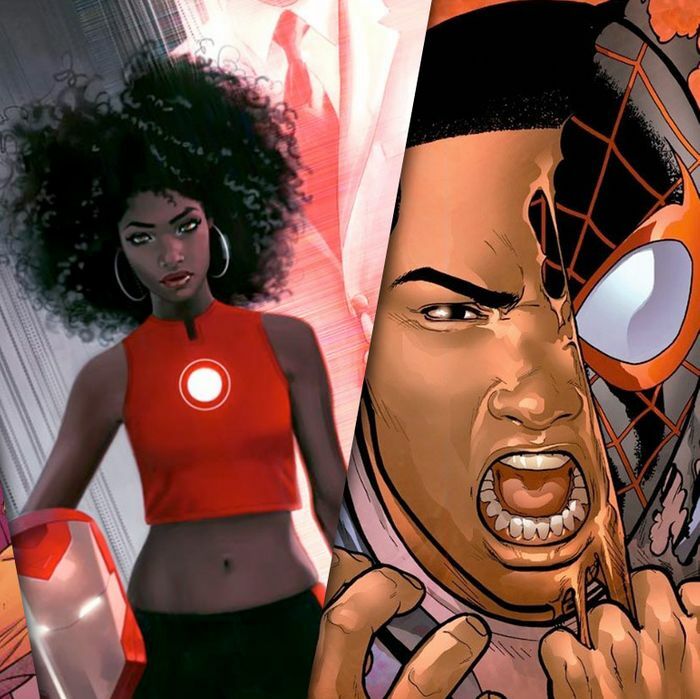 When Marvel Comics announced that a 15-year-old black girl named Riri Williams would be taking over as Iron Man later this year, the company was prepared for an attack from the right. Indeed, Brian Michael Bendis — the veteran scribe who introduced Riri in an Iron Man comic a few months ago and who will be writing her upcoming adventures — sounded a bit cocky about the high ground he held against his potential critics. “Some of the comments online, I don’t think people even realize how racist they sound,” he told Time in the article unveiling the move, referring to past assaults on Marvel for replacing traditionally white characters with nonwhite ones. “All I can do is state my case for the character, and maybe they’ll realize over time that that’s not the most progressive thinking.” Ironically, progressive thinking is what fueled the most pointed backlash to the news. The new Iron Person was emblematic of Marvel’s efforts to become more representative of marginalized groups, but she also prompted a difficult question: What does progress really look like in superhero fiction? Indeed. For much of the history of superhero fiction, the genre lived in that cocoon — white men paid other white men to write stories targeted at white men. As such, the most important characters were, themselves, white men: Batman, Superman, Captain America, Spider-Man, and the like. This is, of course, not unique to comics; it’s true of all entertainment. But in the past few years, superhero comics have been morphing into something more multifaceted and representative, and they’ve been doing it in a way that movies and television can’t. Marvel has taken the lead on this front, using a fascinating tactic to get attention for their diversity pushes. Instead of trying to sell readers on new characters who aren’t lily-white dudes, they simply rebrand their intellectual property. There’s a long tradition of different people taking on the monikers of existing superheroes after the originals die or retire, so why not use that trope in a way that pushes the envelope on identity politics? You’re not going to get much mainstream media attention by pitching the idea of a black girl who uses a robot suit. But if you say she’s Iron Man — a name familiar to anyone who’s purchased a movie ticket in the past eight years — all of a sudden, you’ve got yourself a Time headline. It’s much harder to do those kinds of swaps in film and TV. Doing an all-female reboot of Ghostbusters or theoretically casting a person of color as James Bond is an exceedingly costly gamble; comics are cheap to make, so you can go back on your experiment with little risk. The experiments have thus been plentiful. First came the 2011 introduction of Miles Morales, an Afro-Latino kid from Brooklyn who took up the role of Spider-Man during a period when Peter Parker was out of commission. Then came the 2012 shift in which Captain Marvel was recast as a woman. The next year, a new Ms. Marvel was introduced who, unlike her predecessor, was Pakistani-American and Muslim. There were twin announcements in 2014 that there would be a new, female Thor and a black man wielding the shield of Captain America. Last year brought yet another surprise: White-bread Bruce Banner would no longer be the Hulk — that emerald mantle would be held by a Korean-American kid. Now, we’ve got Riri. All of those changes are pretty inarguably positive. It’s hard to claim that making marginalized identities more prominent is anything but a step in the right direction. But how far does that step really stretch? To be sure, it’s important for fans of the insanely lucrative and ever-growing superhero genre to see people like themselves on the page and on the screen. If you thrill to the antics of spandex-clad do-gooders, you deserve to not feel invisible, especially if you’re a young person whose notion of identity and self-worth are still being formed. And yet, Marvel has been undermining its own efforts in a number of ways. First of all, a lot of the changes have felt decidedly impermanent. The original Thor is still stomping around in the cosmos, waiting in the wings if and when his corporate overlords ever want to bring him back into the spotlight. The same goes for the Hulk. Puny Bruce Banner can go green whenever Marvel needs him to. Even more odd are the situations of Spidey and Cap. In each case, the replacement and the original are still operating in the Marvel universe under the name “Spider-Man” and “Captain America,” respectively. If there are two superheroes with the same name, and one’s had that name since your grandfather was a kid — and has that name in a multibillion-dollar film franchise — why would you ever assume the nonwhite newbie will outlast him? Luckily, there are no signs that Ms. Marvel or Captain Marvel will revert to their original statuses — no one is sharing their mantles. Even better, those two characters, in their new incarnations, have repeatedly interrogated race and gender (and, in the case of Ms. Marvel, faith). The rest have touched on identity politics only lightly, though often memorably. Thor has struggled with the fact that no one seems to take her as seriously as her predecessor, the black Captain America has dealt with racist hate groups, the Korean-American Hulk has challenged Asian-nerd stereotypes, and Miles has wrung his hands over whether he feels comfortable with people talking about his ethnicity. The issue being addressed in the past 24 hours is the fact that four of the most lucrative and famous of these characters — Spider-Man, Iron Man, Thor, and Captain America — are being narratively stewarded by people who don’t share their ethnic or gender identities. Their solo titles are all being written by white men. That’s certainly not to say white people can’t write about race or men can’t write about gender. Of course they can. And Bendis is a very talented writer — his stories about Riri could be dazzling and groundbreaking. But the post–Riri outcry is about matters that are larger than any one story decision: Why should we be prioritizing white, male creators’ takes when a nonwhite, non-male character is put in the foreground? Aren’t we losing a tremendous opportunity by not having people who look like those characters tell their stories? And isn’t it frustrating that, as theblerdgirl noted, a black woman won’t pick up the paycheck for a story about a black girl, especially after Marvel has reaped so much goodwill and praise for introducing one? All of that said, it would be a shame to look at the critiques that progressive nerds are making about the Iron Man news and conclude that they’re calling for a kind of identity siloing, in which only black people can write black characters, only women can write women, and so on. Marvel just needs more black creators and women creators, period, doing all kinds of series. Things are getting better, as of late. According to industry analyst Tim Hanley, nearly 19 percent of the company’s creators are female, a number that’s been generally rising in recent years. Last year, there was an outcry over the paucity of black creators on Marvel titles; there are a few more now, including none other than Ta-Nehisi Coates. However, looking at the backlash to the Riri announcement, one is reminded of Ruth Bader Ginsburg’s oft-quoted line about gender on the Supreme Court: “People ask me sometimes, ‘When do you think it will it be enough? When will there be enough women on the court?’ And my answer is when there are nine.” If a black girl can dream of flying as high as Tony Stark, it’s perfectly reasonable for geeks to dream of a superhero-comics publisher whose staff is as diverse as its characters.